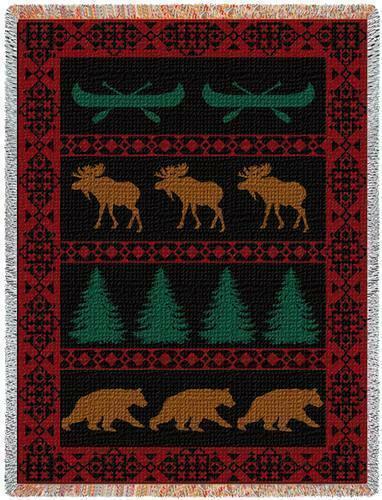 "North Country Lodge Tapestry Throw" Bear, elk, trees, and canoes parade across this richly colored and cozy throw. Perfect for the lodge themed home. This beautiful Tapestry throw is woven on Jacquard looms. Cotton. Measures 48" Wide x 69" Long. PLEASE NOTE: Shipping ONLY within the continental U.S. **Hawaii, Alaska, and Puerto Rico residents please contact seller for shipping quote before ordering.